Next week I leave for a week in England–first visiting Bicester, home of the Association of Personal Historians’ U.K. Regional Coordinator Mike Oke, where we will have an informal gathering and share a meal. Then it’s on to Mansfield College, Oxford, for “Global Reflections on Narrative“, where I and three of my APH colleagues will present a symposium titled “Sharing, Saving, and Studying Life Stories: An American Perspective.” I end with a couple of “mystery days” (nothing scheduled yet) before it’s back to Heathrow and home. How do you capture your memories and still have time to enjoy your trip? 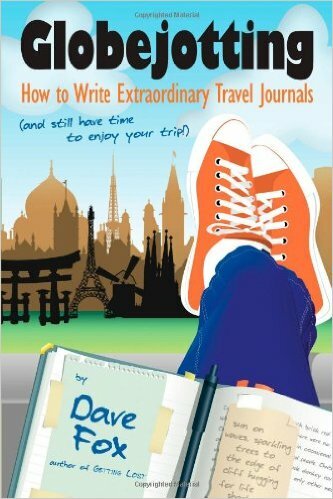 Follow the advice of Dave Fox, humorist and author of Globejotting: How to Write Extraordinary Travel Journals. Speed journal: Write quickly, without judging the quality. Cover the highlights: pick out three or four bits of each day instead of recording a step-by-step account of each day. Write on themes, not activities: pick one topic from the day’s experiences that stands out, then compare and contrast. Play with words: observe, then explore metaphors and similes for what I see, hear, sense. Talk to people: Start conversations. Then observe more than what is said. That’s just some of the advice I noted as worth keeping in Dave’s sunny little book. You can learn more about Dave–a traveler, tour guide, funny guy–here. I am looking forward to my first cup of proper British tea since 1983 (the Great Colette and Sarah Bicycle Adventure) and plenty of Brexit brouhaha. Don’t forget to write about YOUR summer vacation! Have a marvelous time! Thanks for your recommendation on Dave Fox’s “Globejotting” – I envy you your “proper” cup of British tea!